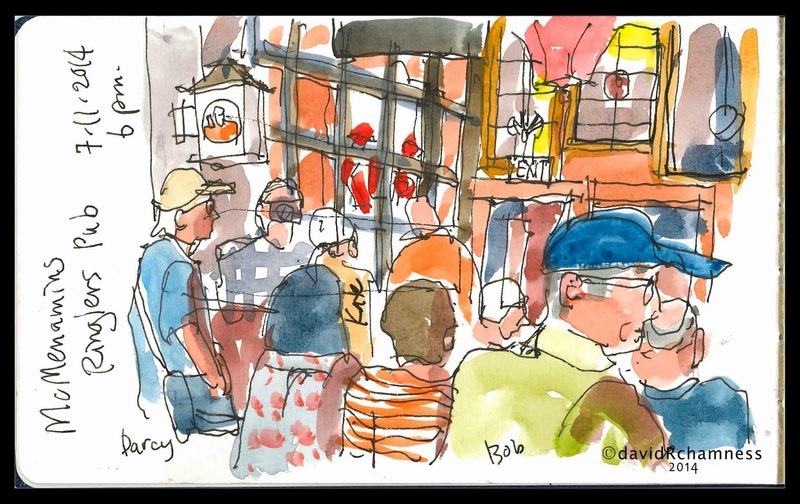 My wife and I had a great time in Portland sketching, meeting new & old acquaintance's (West Coast Sketchers and some East Coasters too!) and celebrating our 28th anniversary. We decided to make it a weekend because there was way too many things to do in town. We stayed in a great AirBnB called "Stay@ Jan's" that we highly recommend down by the Oregon Health Sciences Campus. An easy street car ride to downtown for a buck! Friday evening we had great beer and food at McMenamins Ringlers Pub. We spent the time talking and sketching each other in the great atmosphere of this wonderful Portland establishment. 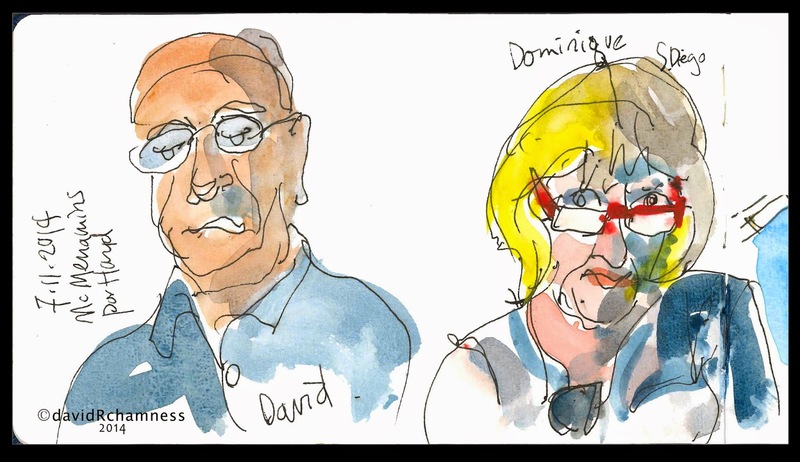 Some Vashon Sketchers Darcy and Bob. 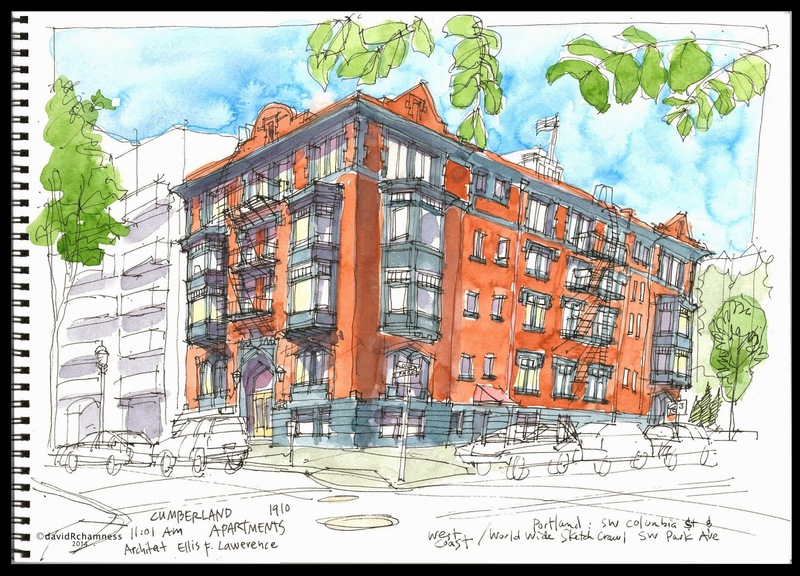 My first Sketch of Saturday morning was of a grand century old apartment building located on the edge of the South Block Park near the museum. The weather was perfect and so I took my time in capturing this view. 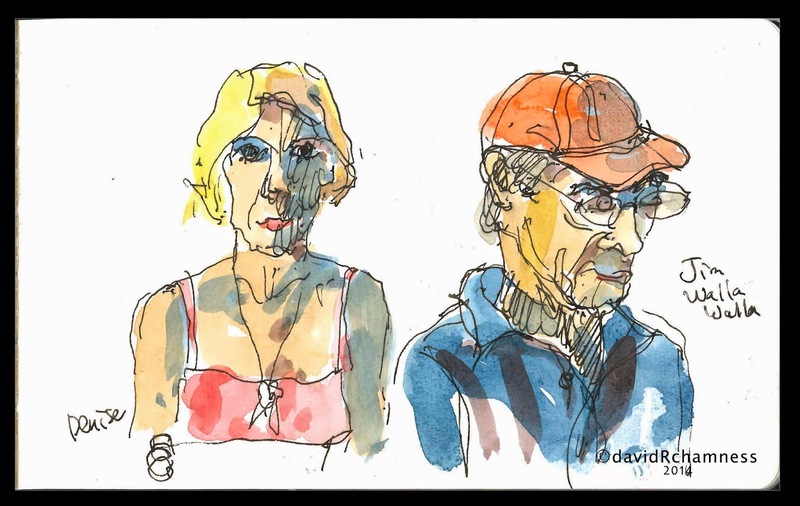 In the afternoon as the heat increased I sketched two down by Directors Park where a Bastille Day celebration was happening; good French food and music! 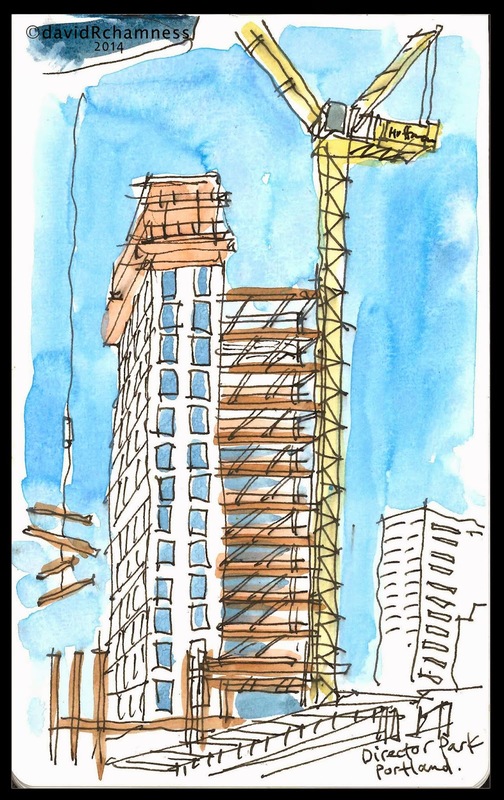 The first one was an older classic building with Pastini's restaurant at the street level and the second one was of a new high-rise being constructed on the edge of the park. 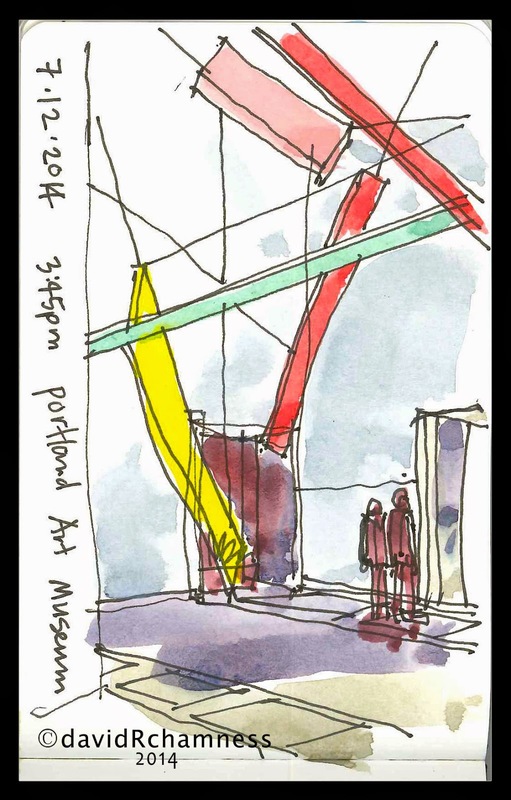 Before the afternoon meet-up as the temperatures continued to rise and we were all getting tired, I headed into the Portland Art Museum an did a quick sketch of a modern sculpture hanging in the lobby. The air conditioning was wonderful! Finally my wife and I celebrated a wonderful dinner in the Pearl District before returning to our BnB by street car. It was a full moon rising as we walked from the the street car to our room for the night (the hospital tram overhead). The next morning we left and drove up the I-5 corridor to finish out the weekend with a Sounders game against who-else but the Portland Timbers! Great game and weekend with a Portland theme. This is a really nice collection of sketches and photos, David. Looks like it was a really fun day. Wish I could have been there. What a great posting, David. It sure does look like it was a wonderful time! And the sketches are great! Thanks for sharing!